Don't be afraid to see this movie, after seeing characters like Fred Krueger, Jason Voorhees and Michael Myers it’s not really scary to see small rat like creatures running around trying to kill people. The creatures remind me of the ‘little people’ from the 1997 movie The Borrowers. These creatures are revealed during the first 15 minutes of the movie so the suspense of ‘what is it’ is taken away. Surprisingly enough 5 minutes before the end of the move there is a little twist that made me think ‘not bad’ but after that there is an unnecessary 5 minutes which makes you take that back. Here's the story, eight year old Sally Hurst (Bailee Madison) comes to live with her fater Alex (Guy Pearce) and his girlfriend Kim (Katie Holmes). Alex and his girlfriend are restoring Blackwood Manor. 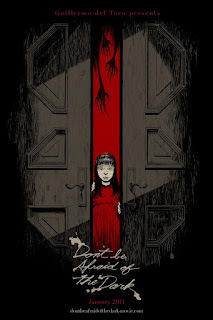 Unknown to them there is a mystery in Blackwood Manor and as you probably would have guessed, little Sally stumbles on to that mystery. Overall it’s a very, very average movie. If you want to watch a horror movie with your kids or your grandparents, this is the movie to watch.